Rambling Moose: Who's Been Here? 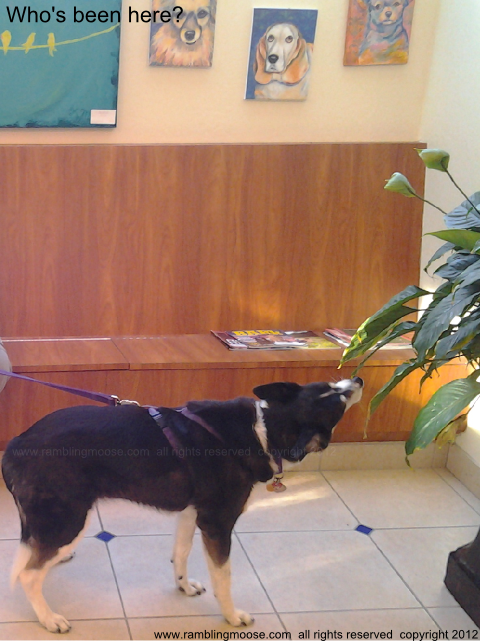 Now that she's reached her "Senior Years", Mrs Dog is making the best of her time when visiting the Vet's office. She's loving the short hop from the house in the car. She's always been a better riding companion in the Jeep than just about any human I know. I'll get out the blanket, lay it out on the seat, open the door and she's in there like a shot. At least she used to be in there like a shot. Now that she's almost 12-that-we-know-of, she stands by the door of the car and wags her tail with a foot up on the sill of the door. Those old bones won't pull her up into the cabin of the Jeep on a good day. She needs help. Once we get to the Vet's, it's a challenge to keep her distracted from Those Other Dogs. Eventually she'll settle in. Just hand me a kleenex, there's cats about. Of course, any good herding dog finds things to get into. The corners are full of new smells, the walls have fur, and all is different. The mental stimulation is good for any dog, even one who is not as smart as my girl still is. It's just a stressful time. All you have to do is let the leash go and she's glued against the door trying to make a break for it and the green prairies of Fort Lauderdale beckon. Her prognosis is good despite her Chronic Kidney Disease. She's got between two weeks and two years. The key is finding something she'll eat that will keep her going. Right now, she's enjoying Honeycomb Cereal. Yes, a dog that will eat your kid's cereal is pretty common. A dog that will only eat your kid's cereal is my dog. Strictly speaking there are other things, but the rule of thumb is if she shows interest, she gets some. The diet has been turned upside down, dog food is off the list in favor of carbs and fat in order to keep the protein levels down. On the other hand, she's got a lot of energy on this weird diet of Granola Bars, "Cannibal Crackers", and a burger every other day. Too many burgers and she is all "logy" the next day until the salt in the blood balances back to normal. We're all learning. She's trying to teach.